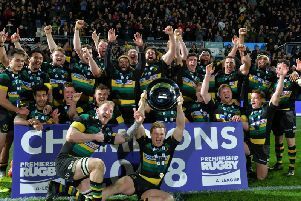 Gloucester director of rugby David Humphreys gave full credit for Saints as they bullied their way to victory at Franklin’s Gardens on Friday night. Jim Mallinder’s men secured a 15-3 win against the Cherry and Whites, with the success built on the strength of the pack. So good were Saints that Gloucester were forced to replace loosehead prop Paddy McAllister after just 23 minutes. But that failed to stem the tide as the home side continued to win penalty after penalty in the scrum and McAllister’s replacement, Yann Thomas, was sin-binned late on. Stephen Myler landed five of his six penalty attempts to give Saints a comfortable win, and Humphreys later admitted that his side struggled to compete in the set piece. “It’s never good to lose, we knew coming here it would be a set-piece game and the conditions made that even more important,” Humphreys said. “We gave away a lot of penalties and when you do that somewhere like this, against a kicker like Stephen Myler you’re going to be punished and that was the difference. “Paddy came into the team at the start of the year and our scrum has been good all season up until now. “We came up against a very good pack and you have to credit Northampton for the quality of players they have and the quality of their pack – they put us under pressure and we couldn’t get any momentum. Gloucester were sitting one place above Saints going into the game at the Gardens, but the Cherry and Whites have now slipped down to 10th. And Humphreys added: “It’s the first time this season we’ve been penalised at the scrum. We’ve been very effective, whether it’s our starting team or coming off the bench.